The sensitivity of play to variations in food availability has been cited as evidence of the costliness of play, since energetically stressed animals dispense with costly behaviours. However, the causality of the relationship between nutrition and play has not been adequately tested. Using weight gain as a measure of food intake, we documented the food consumption of free-ranging meerkat, Suricata suricatta, pups and found that long-term nutritional status (weight gain over a 6-week period) was positively correlated with rates of play. We confirmed the causality of this relationship by conducting long-term (4�weeks) provisioning experiments that raised the nutritional status of experimental pups, subadults and adults. 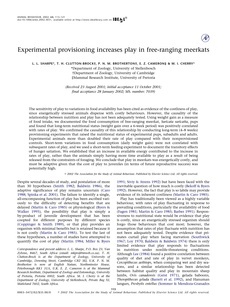 Experimental animals more than doubled their rate of play compared with their nonprovisioned controls. Short-term variations in food consumption (daily weight gain) were not correlated with subsequent rates of play, and we used a short-term feeding experiment to document the transitory effects of hunger satiation. We established that an increase in available energy contributed to the increase in rates of play, rather than the animals simply having more time available to play as a result of being released from the constraints of foraging. We conclude that play in meerkats was energetically costly, and must be adaptive given that the cost of play to juveniles (in terms of future reproductive success) was potentially high.